Babies start to crawl between six and 10 months. And with crawling comes climbing, reaching, cruising, etc. 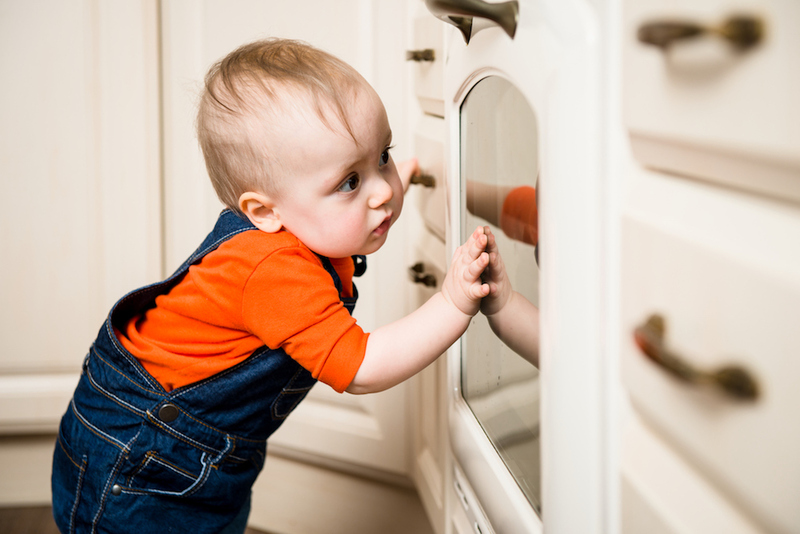 Your little one will turn into an explorer before you know it and you want to make sure your home is free of hazards. Below are some tips for babyproofing your home. It's best to start preparing as early as you can in your pregnancy. Make sure baby is playing with toys that are larger than their mouth to prevent choking. Also make sure the toys don't have buttons, ribbons, eyes, beads or strings attached to them. Make sure all cleaning supplies, medicines, and any other harmful substances are safely stored on a high shelf. Don't leave your purse or toiletries bag in a place where baby can reach. If you have any plants in your home make they sure they are out of reach. Use furniture straps to tie down all furniture and make sure televisions (especially flat screens) are completely secured. Make sure sharp corners are covered with edge guards. If you have any tall floor lamps, secure them behind other furniture. Keep your baby safe from electrical hazards by keeping any loose rods fastened against the wall. Put outlet covers or block outlets with furniture. Unplug all appliances (toasters, hairdryers, etc.) after you use them. Do not leave appliances (such as your curling iron) unattended while they are on. All knives, plates, and heavy pots should be locked up tightly or put in high cabinets. Put trashcans in cupboards or make sure they have child-resistant covers. Make sure the pantry door is secured and the refrigerator has an appliance latch. Distract baby by keeping an open cupboard with safe items. If you can, buy your crib new as this will decrease your chances of it deteriorating. Make sure the mattress pad is securely on mattress so it won't slip off in the night. Make sure toys are not in crib while baby is sleeping. Hang a baby mobile high enough so baby can't reach it. Avoid thick pillows or quilts. You want to make sure you are preventing baby from going into rooms you don't want them to go in by using gates, door locks, and knob covers. Also, make sure the stairs are blocked off with a baby gate. Safeguard pool and hot tub. NEVER leave your child unattended near water. Cover the bottom of the bathtub with a rubber mat to prevent slipping. Keep baby away from any open windows. If there are sliding doors, put colorful stickers on them to prevent baby from running into the glass. Check ties on blinds and curtains. Get down on your hands and news and explore your house from a child's point of view. This may seem strange but you don't want to miss ANY possible safety hazards such as pins, nails, buttons or cords that have fallen. Fighting Smart: A Guide to Preparing Your Relationship For Baby.